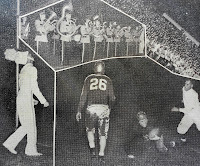 Today marks the 75th anniversary of the first night football game played at Central. On Friday, September 23, 1938, both football fans and players alike were thrilled for this exciting event. Back in 1938, some things were different at Central – the Institution was Central State Teachers College, tuition was $15 per term ($30 for non-residents of Michigan), athletic teams (which were only for male students) were known as the Bearcats, and home football games were played at Alumni Field, which was located in the grassy area between where Finch Fieldhouse and the Health Professions Building stand today. 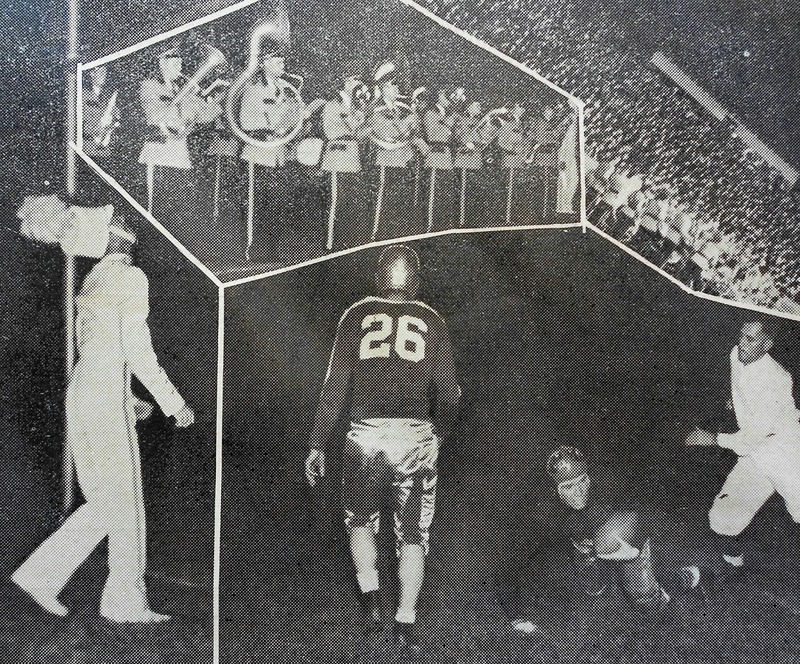 While some things were different 75 years ago, other things would be familiar to Central students today, especially the level of "fired-up-ness" of the students and fans for the game that Friday night – the first game of the 1938 season. The stadium was packed with 2,500-3,000 fans - quite a bit considering that enrollment at Central was around 2,000 students. Coach Ronald W. Finch (the namesake of Finch Fieldhouse) led the Central squad against the team from Lawrence Tech under the illumination of fifty-two 1,500 watt flood lamps, which had been strung up during the summer at a cost of $3,000 (around $50,000 today). Players liked the idea of playing at night. At least one said he was grateful to no longer have to play under the hot sun all of the time. Fans approved of the night game too. The Central State Life student newspaper mentioned some spectators thought it was easier to see the plays developing under the lights compared to day games. The only people who might not have been fond of the night game were photographers who had trouble snapping pictures – their technology worked much better under natural light. But the press made it work as best as they could with some strong flash power and overall, the atmosphere of the game was a big hit. The hoopla and novelty of the event was not the only success - the Bearcats trounced Lawrence Tech 44-0 in the first game of a 7-1 season. All of the home games in 1938 resulted in victories. In fact, Central outscored opponents 158-6 in the four home night games played that season. Today, the wonderful atmosphere of a night game means that playing under the lights is still a highlight of the college football season. And there’s no better way to finish off the evening than with a CMU win!